A domain by any other name . . . Yesterday the Knitting Heritage Museum project got a another boost. Having a free standing web page is important for ease of contact, creating a presence, and building credibility. Figuring out who should host it, and what platform and template to use are all barriers to getting a web page up and running, not to mention having fresh, informative content. Some of those barriers tumbled down thanks to a hosting offer. Our first step is to select a domain name; this is a different quest from naming a non-profit organization, but no less important. Frankly, picking a domain name intimidates me. I shared my musings with some of my ad hoc team. I realized that I could expand the circle of advice, by asking your help. inclusive (including references to both knitting and crochet) – something our current name lacks. memorable or at least easy to remember (if I could give an example, I wouldn’t have to ask you all for help <VBG>). One bit of advice was to create an acronym, based on the initials of the name we use. Versatile & flexible – something that the KnittingandCrochetHeritageProjectorInitiative.org could grow into. Clearly depict who we are: YarnArtsHeritage.org is appealingly inclusive -but who know what it means, since it doesn’t even use the words knit and crochet? At least not create confusion or imply what we are not: Hookandneedleheritage.org – is this for tattoed fishermen? I pondered whether it might be a good idea to drop the word museum from the domain name in favor of calling our effort a Project or initiative. That way even if we never get to a physical brick and mortar establishment, our name would not imply that we fell short of our goal. Now that i have shared my angst, here are my ideas. You are welcome to say none of the above and suggest something better. Should i shorten Knitting to Knit?? YAH with project or initiative or museum . . . . .
Let my know what you think! A Gentle Reminder – Early Bird Registration for the symposium ends Sept. 5. Rooms in the Lowell Center – the most convenient place to stay are limited. Make plans to join us at this important event. Join us for the first symposium in support of establishing of a Knitting Heritage Museum, to be held in Madison, WI Nov. 8-10, 2012. Co-hosted with the Wisconsin Historical Society, Ellsworth Brown, Director, and funded in part by the Yarn Group of The National NeedleArts Association. This symposium is intended for textile curators, conservators and collectors, educators, designers, industry representatives, passionate practitioners, and anyone who has ever thought that knitting and crochet deserved a museum, but didn’t know where to start. Susan Strawn, author of Knitting America: A Glorious Heritage from Warm Socks to High Art, and Melissa Leventon, principal of Curatrix Group Museum Consultants and Appraisers, and Consultant to the new Queen Sirikit Museum of Textiles in Bangkok, will be speaking. Trisha Malcolm, VP and Editorial Director of Vogue Knitting [invited] and Jack Blumenthal, VP of Lion Brand Yarn will present industry perspectives. Highlights include the opening of a “Curators’ Choice” exhibit of historic knitted and crocheted objects at the Wisconsin Historical Society, created in honor of the symposium, and a closing book signing with knit and crochet authors and designers. Attendees will participate in facilitated breakout sessions to determine directions and next steps as we develop a place to collect, document, preserve and share our knitting and crochet heritage. Don’t miss it! Come share your big ideas and recommendations. Knitted and crocheted objects are a valuable part of our heritage, with compelling stories to tell. Early Registration closes Sept. 5, 2012. Please share this announcement with your friends and professional colleagues. Contact knitheritagemuseum@gmail.com to get involved. Thanks goodness for our founding sponsor: The Yarn Group of TNNA, and our generous co-hosts, the Wisconsin Historical Society. I am stoked! What a line-up to entice people to convene and begin the process of forming a museum to honor our knitting and crochet heritage, and laying the groundwork for the future. I created the image below to be the symposium’s banner. I could have used objects already in a museum, but the copyright issues made using the heritage items that I have been collecting the easier course. Are you interested in identifying, preserving or displaying knitted or crocheted objects? Knitted and crocheted objects, works of the hand and heart, provide snapshots of the ethnic traditions and socioeconomic status of the maker and wearer. An infant’s christening gown celebrates an intergenerational milestone. An intricate Shetland shawl or Bohus sweater knit for hire illustrates the often unsung ways women supported their families when male incomes disappeared. A sock, knit during wartime, connects the maker at home to the warrior at the front. These often humble and utilitarian items were worn, passed down from generation to generation and sometimes donated to a local or regional museum. Many museums have these items in their collections but are unsure how to preserve, categorize and display them. • Engaging a segment of the population not now actively being served. • Harnessing skilled expertise, not necessarily available from staff or consultants, to allow passionate practitioners to share their knowledge and so elevate the status and appreciation of knit and crochet. • View a special exhibit created by the curators of the Wisconsin Historic Society’s Textiles and Costume Collection and UW-Madison’s Helen Louise Allen Textile Collection. 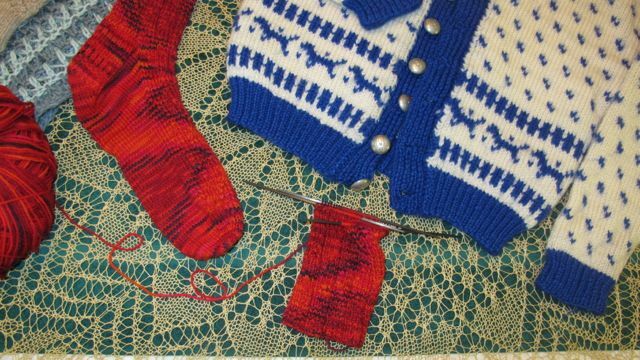 • Participate in interactive forums and discussion groups to develop a vision and collection scope for an initiative to preserve, document and share knitted and crocheted objects. • Hear speakers including Dr. Susan Strawn, author of Knitting America: A Glorious Heritage from Warm Socks to High Art, and Melissa Leventon, principal of Curatrix Group Museum Consultants and Appraisers; Consultant to the new Queen Sirikit Museum of Textiles in Bangkok (opened May 9, 2012). And anyone who has ever thought that Knitting and Crochet deserved a museum, but didn’t know where to start. Our registration page with Regonline will go live in the next 48 hours. When it does, go to http://www.regonline.com/knittingheritagemuseumaworkinprogress to sign up to join us, for an historic kick-off for creating a place to Collect Preserve Research and Share Our Knitting and Crochet Heritage! I hope you’ll join us. There is much work to be done, and no time to waste!